Liam Farrell reveals how the Red Bull camp has given Wigan Warriors wings! Liam Farrell described a pre-season trip to the home of F1 giants Red Bull as “an eye-opener”. The Warriors’ four-day training camp culminated with a visit of their Milton Keynes head-quarters yesterday. And forward Farrell said: “We thought we went into a lot of detail, but they take it to a different level - it’s literally down to the tiniest screw and bolt. Their four-day trip combined fitness and skills sessions with team-building exercises and experiences. Farrell says new recruits Jarrod Sammut and Joe Bullock are settling in. “Joe has been in since pre-season started on day one and he is keeping his head down and working hard, and making a bit of a name for himself,” he said. “He’s pushing for a place in the side. Another new face is, of course, coach Adrian Lam. 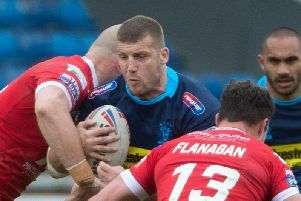 Fringe halfback Josh Woods has been at the training camp despite persistent rumours linking him with a loan move to Leigh.